The Chief Executive Officer of the Russian Investment Agency Yury Voicehovsky took part in a seminar called “Sharing best investment practices”, which was held in the Ministry of the Regional Development on August 15, 2014. 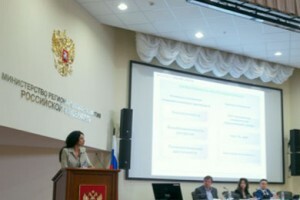 The event of such a format took place in the Ministry of the Regional Development for the first time. It is planned that in the future such meetings will be organized at least once a quarter. At the seminar, the representatives of a number of regions presented to their colleagues success stories of attracting investments in various projects and talked about the investment potential of their regions. Summing up the seminar, the Chief Executive Officer of the Russian Investment Agency, the Adviser to the Minister Yury Voicehovsky noted the importance of such events and their benefit for economic and investment development of the regions. “I am confident that the recommendations made at today’s seminar will be needed in practice” – said Yury Voicehovsky.